Click for the latest free patterns! Before & after photos of my studio bathroom! Make a donation to help take care of stray & feral kitties. For more information, click here. I guess this is kind of like my "family photo album"! These are all my kitties and how they came to live with me. ALL of my kitties have been fixed.....if they come to be at my house, they are fixed and it has really cut down on the stray kitties on my street and they are all healthy. If you wonder how I afforded to get 11 kitties fixed, email me! (There have been more that have been fixed--some were feral or went to another home.) I will give you some ideas or tips on getting help! My blog is moving to http://catspyjamasblog.blogspot.com/. I'll keep this one open as long as possible but won't posting anything new here. Hope to see you there!! We are so close to having my studio ready to open. I hope you'll follow my new blog so you can see photos of it when its ready. I know I've been working on it forever, but we are on the last little details inside and just have to finish a few little things outside when we can get breaks from all the rain we've been having. With Christmas just around the corner, I was thinking about some of the great (and not so great) gifts I remember from my childhood. One of them was Baby Alive! 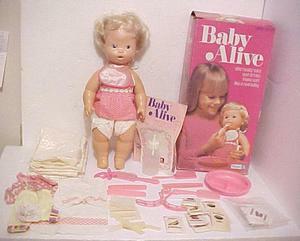 I must have been about 4 or 5 and was so excited when I woke up on Christmas morning and got a Baby Alive! Look at all the neat stuff you got with her! I found one on ebay with all her accessories! Of course the first thing I did was mix up some of that gross looking food and feed it to her. I was surprised to find out to make her eat, you have to press her chin and then her mouth would move up and down and it made this weird grinding noise. It was kind of weird, but I could overlook it. So I mixed up some kind of green food for her and fed her. But I was shocked when I realized that food was going to end up in her diaper!! I did not want to clean up that mess!! I remember Momma standing at the stove making gravy and biscuits and I showed her. She said, "she's your baby, you have to clean her up." I don't know if I ever even fed Baby Alive all of her food. I just didnt' want to have to clean all that up! Dukes of Hazzard digital watch that played "Dixie"
One of my new favorite authors!! The Cat's Pyjamas on Big tree...and a chicken casserole recipe! Vanessa Hancock on Big tree...and a chicken casserole recipe! Susan on Big tree...and a chicken casserole recipe! brand shoes on Water loving kitty! christian louboutin sale on Water loving kitty! burberry outlet on Water loving kitty!